A FOCUS ON EDUCATION AND A LOVE OF LEARNING HAS ALWAYS BEEN A CORE VALUE TO NAOMI LOPEZ. Naomi Lopez and her family would not be where they are today without their persistent focus on education. Rico at 20 years of age to pursue a master’s degree in the United States. “Opportunity motivated her to leave,” Naomi says. Javier also made the difficult decision to leave his family and home to advance his education—obtaining a master’s degree in Ohio and then moving to Indiana to complete a Ph.D. in Geography. The two eventually came to Minnesota when Javier got a job as a professor at Minnesota State University, Mankato. Here, they raised their two daughters, Arianna (20) and Naomi (18). Naomi was the 2018 recipient of the Ogden W. and Jane M. Confer Scholarship. Each year, the scholarship is awarded to a student who exemplifies leadership skills, has shown a dedication to the Mankato community and plans to attend a four-year liberal arts college. When Jane and Ogden W. set up the fund, those requirements were important to them. In the fall of 2017, Naomi began her liberal arts education to prepare for life at Carleton College in Northfield, MN. Inspired by Supreme Court Justice Sonia Sotomayor, she plans on majoring in political science and minoring in public policy. Naomi is passionate about social justice, and she hopes to put that passion into practice in family and immigration law. “I enjoy being able to make an impact and directly help people,” she says. At Mankato West, Naomi was already finding ways to do just that. 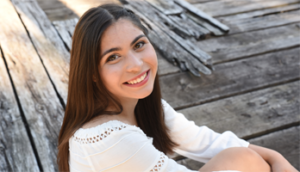 She developed leadership skills as a section leader in band and as a local advocate for the “Enough” movement to promote gun control and school safety. In the midst of a volatile political climate, she has been encouraged to see young people lead movements for change and run for political office. In addition to education, faith plays a significant role in Naomi’s life. She has been an active member of her church youth group and felt it was important that high school students provide leadership and function as role models for the younger members. Determined to help her youth group remain active and vital, she continued to be involved throughout her senior year.